I've been thinking a lot about The Palms lately. At this point I'm pretty settled in my new house. It's furnished, warm and comfy, and pretty much they way I want it. I moved into the house the end of July 2018 and haven't even thought about taking a trip. As much as I love The Palms and enjoyed traveling and living in her for more than seven years, I think my RVing days are over. I've loved living in the desert, in the forest, next to the Rio Grande, the Pacific Ocean, and various rivers and lakes. I've loved getting to know the different birds and checking them off in my bird guide. I got some GREAT photos. One of the best parts of RVing off the grid for me was waking up and seeing cattle all around The Palms. Hearing the MOOOOOing throughout the day. The horse families, especially after the birth of new foals, walking around the campground at Bluewater Lake State Park in NM were such a gift. Especially when they were in my campsite. The sunsets! Wow, I can't tell you how many gorgeous sunsets I've enjoyed! And of course, friends I've met on the road. First meeting I liked you all, second meeting you were friends forever. Some of you I probably won't ever see again, but you will be in my heart always. Great friends, great times. Thank you! 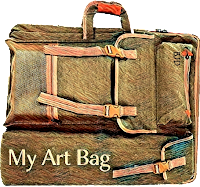 And the independence of living off the grid was something I've wanted to do since I read The Private World of Tasha Tudor years ago. It's such a gorgeous book, her lifestyle just yelled at me, "YOU NEED TO DO THIS, TOO!" 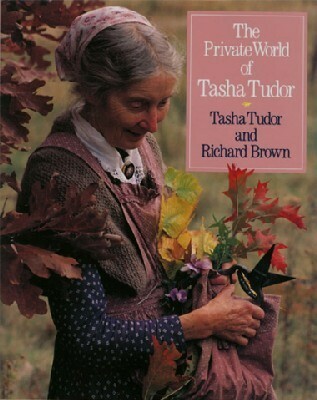 I know that living full-time in a motor home for seven years off grid wasn't the same life that Tasha Tudor lived. But it was closer than city living in a house. I'd call it different but somewhat equalish. Only those people who have full-timed for a while and loved it will understand all that I'm saying here. It's something I can talk about, but like few other things, you can't possibly understand unless you've done it. There are so many parts in the puzzle of full-timing, especially if you're boondocking or drycamping. And the State Parks in New Mexico are so great! With my annual pass I could always pull in any day of the week, any time of the day and have a place to live for two weeks. Maybe by a lake or river dry camping, or if it was super hot or cold - and I was lucky - an electric site miraculously empty when I arrived (I never made reservations). And they had clean restrooms with nice showers! Bonus! 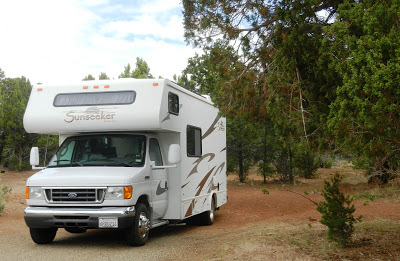 Learning all the systems in the rig and having checklists/alerts for the motor home maintenance items; knowing all the time how the solar panels are doing, and it wouldn't be a good idea to land in a great campsite on BLM land with full black/grey tanks and no water in the water tank. You have to keep track of that all the time. And also for the truck. Watching the gas tank - you don't want to run out of gas in the middle of the desert. I could go on and on.... it was a great learning experience, a thrilling lifestyle, a very full-fulling seven years in so many ways. I can't say enough positive things about the whole full-timing lifestyle or about The Palms. The Palms has been so good to me. I was lucky to choose the right rig the first time. My full-timing years would never have been the same in another motor home. She's a beautiful rig with the perfect floor plan for me. The original owner bought her with almost all the upgrades available, and then apparently didn't use her. So she was like a brand new motor home when I bought her. I really appreciated all the upgrades. 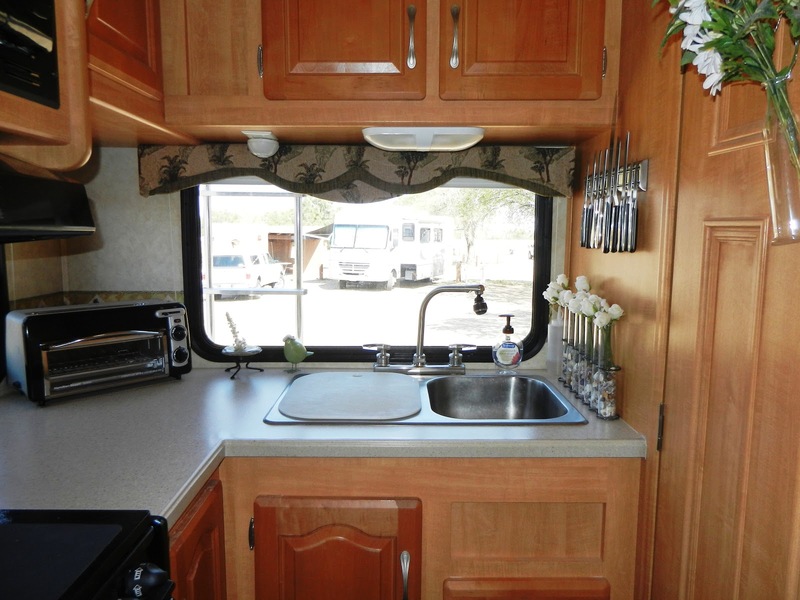 I especially like the large bathroom and the rear kitchen, also the long fold-out couch. And my dinette is so comfortable that I spent most of my time at the dinette table. The over-the-cab bed was also really comfortable. I never woke up with back pain or any other issues, it just worked for me. Also the great storage inside the rig. I guess I really love everything about her. From the day I bought her, I knew how lucky I was to find the exact motor home I had researched and was looking for. And the truck has been trouble free, too. Up hills she's a workhorse - with her big engine I never had issues going the speed limit up any hills. She just purrs along. I did have to buy more gas because of that big engine. I usually got 8 or 9 mpg, but I didn't drive her slow. If the speed limit was 65 or 70, I drove her 65 or 70 mph. Another driver's gas mileage might be higher, but since I didn't travel far, just often, it worked for me, even on a small budget. I planned where to go and when - depending on gas prices like most RVers. I always felt SO LUCKY! I never had an exit plan. I figured I'd keep full-timing until I couldn't anymore or didn't want to anymore. So, now that I'm settled in a sticks 'n bricks house again, can I REALLY give her up? For a while I wondered if I'd ever want to use the RV again. Maybe in the summers when it's so hot here, it would be nice to get out of town for a month or two up in higher elevations. For the last six months I wasn't sure, but I was leaning that way. But is it a good plan, a good financial idea, to keep her on the side of the house for 10 or 11 months every year and only drive her out of town for a month or so each year? Not really. Maybe selling The Palms is my best option. If I change my mind after she's gone, I can always buy another motor home. But I'll never find one like The Palms again. That rear kitchen, the high ceilings, all the upgrades... I guess that would be okay, because the new rig would be just to get out of town for a while, not to live in 24/7. And that's if, a big IF, I missed RVing and wanted another motor home. “Travel isn't always pretty. It isn't always comfortable. Sometimes it hurts, it even breaks your heart. But that's okay. The journey changes you; it should change you. It leaves marks on your memory, on your consciousness, on your heart, and on your body. You take something with you. Hopefully, you leave something good behind." Of course I had MANY "pretty" times and living in a motor home is VERY comfortable. Meeting great friends, seeing beautiful scenery, camping with large animals close by, feeling so confident driving my home down the road. Living off grid gave me such a feeling of independence. And I was able to live frugally, which I had never really done before. I found I was GOOD at being frugal. I was healthy and happy 99 percent of the time. But of course it did sometimes hurt, my heart was broken, traveling in an RV left many marks on my memory, my consciousness, my heart and my body. I don't know if I left anything good behind, but I sure did take LOTS of good things with me. It's one of the best experiences in my lifetime. If I decide to sell her, now is the time. She's in great shape inside and outside, the exterior has recently been buffed out, decals removed and painted back on by a professional. There is some normal wear and tear on The Palms, but nothing major. All her systems are in good working order, mileage is still low and the truck is in good shape. Everything has been well taken care of and I have all the original manuals, service documentation, and receipts for the upgrades I added. And all this is why I'm having so much difficulty coming to a decision about whether to keep The Palms and not use her much, or sell her and let someone else enjoy her as much as I did. But I think I've already made my decision - I'm going to sell The Palms. It just makes sense. I'll post more soon about selling The Palms - with lots of information and photos. Really sad, right? But when the new owner drives her down the street, I'll know exactly what they are experiencing and I'll cheer them on. Because I felt the same way when I bought her. And every time we took off for a new location. And they will leave me in a puddle of tears, for sure! More Charlie Photos - He's getting so big! Charlie has made strides during the last few weeks. He's gone from 18.4 pounds the day I adopted him on November 6 to 34.2 pounds on January 3. So he almost doubled his weight in two months. He's doing well with his training. He's really hard to walk, soooo strong and tries to pull me along, which I can't let him do. I've invested in different harnesses and a gentle lead that goes over his snout. That works best, but no matter which we use, our walks are very short. If he's pulling me or fusing with his lead, the walk ends and we turn around. Other than that, he takes direction and training really well. I've been called for jury duty next Tuesday, so I found a doggie day care in town that will take him. We've gone for three or four days in the last two weeks, just 2.5 to 3 hours each time, but on Tuesday if I'm chosen for the jury, I guess I'll be there all day? I haven't ever been on a jury and have always wanted to, but my brother is a retired Sheriff in California, and that might keep me off the jury. We'll see. I'm gong to keep bringing Charlie to The Dog Shak because he LOVES it and it's great for socializing him with other dogs. 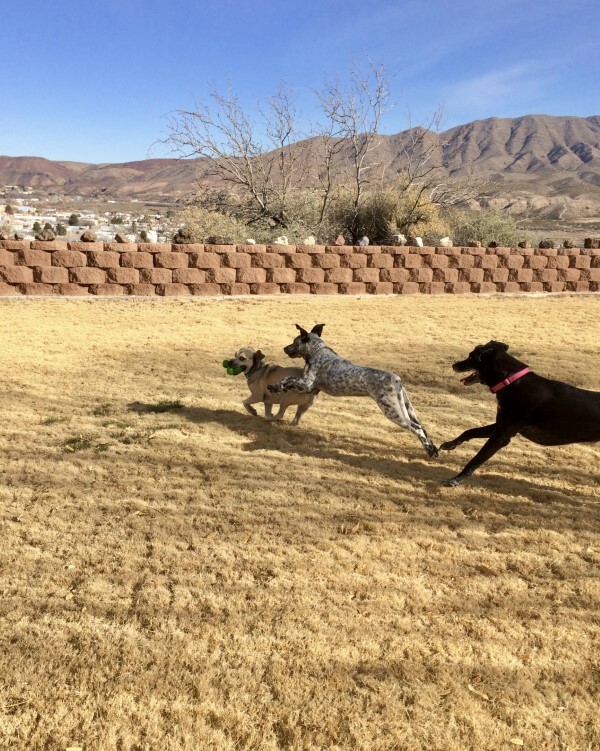 He has two best friends, one is a small one year old dog that the owner adopted, and the other is a day care dog, T, who is a large black lab. They are both SO GOOD with Charlie! Luckily Charlie loves it there, the other dogs like him, and Anissa, the owner, likes him. This will also be nice if I need some time without Charlie to get things done. He's too young to leave alone at home, and I wouldn't leave him in his crate for too long. He was neutered two weeks ago, and also had a dangling dew claw removed, so he had to wear a cone for a while. Poor Charlie! Believe me, it hurt me more than it hurt him! With a Heeler, instead of having his nose on the back of my calf all the time, I was crashed into with the edge of a plastic Elizabethan Cone. OUCH! I ended up taking it off early, and everything healed well. Some of Charlie's tricks - since he's deaf, he has to watch me for hand signals. PAW - We do this from a "sit." It's a hand out, palm up. You can see him watching me and starting to raise his paw. Then he watches my hand. He knows a lot of words/signals now, but SIT, STAY, LAY DOWN, PAW, PUZZLE, and WALK are his best ones. Thanks for stopping by. Lots of things going on here, more next time.